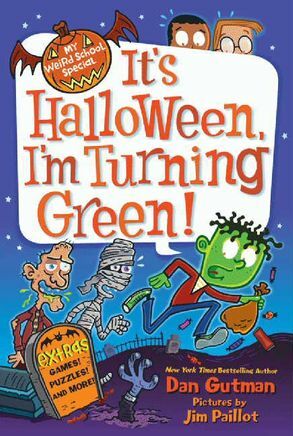 My Weird-School-Special: Its Halloween, I'm Turning Green – Shelf Stuff Shelf Stuff | My Weird School Special: It's Halloween, I'm Turning Green! It’s Halloween, and you know what that means! Candy! Costumes! More candy! What would happen if a kid ate a million hundred pounds of chocolate in one night? One thing’s for sure—when the kids from Ella Mentry School go trick-or-treating, it will be a Halloween to remember. Join A.J. and the gang from My Weird School in this special series of after-school, holiday-themed chapter books featuring hilarious stories and thirty-two pages of games, puzzles, and more. This is one weird Halloween special you won't want to miss!